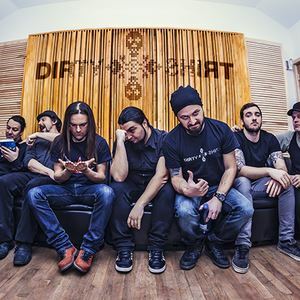 Dirty Shirt is a Romanian alternative/industrial metal band. In the mid 90's, former members of a rock project (Eclipse) decide to form a new band, called Dirty Shirt. The first demo is released in '96, entitled “Alone”. Even if the main influences are from alternative and progressive metal, the band adds originality and its personal touch, including very heterogeneous elements. For the following three years the band performs at several concerts and festivals in Romania, often winning important awards. It is in 1999 that Dirty Shirt receives the first award at Top T Buzau Festival, which consists of a studio record. Furthermore, in 2000, the band realizes its first album, “Very Dirty” (Promusic Prod) and performs in a series of concerts and is invited for several national festivals. A new demo is released in 2001, “Contradictie”. In 2009 the band prepares the new album “Same Shirt Different Day” (recorded at Kallaghan Studio in France and mastered at West West Side Music, in USA) which contains new songs and some “hits” from previews demos. “Same Shirt Different Day” is a human album showing Dirty Shirt’s personality from different angles: funny, aggressive, melancholic, crazy, and why not, sometimes intelligent. Naturally you will find influences from heterogeneous styles: metal, industrial, Romanian folk music, funk, electro…Musically, Dirty Shirt consists of two singers with complete opposite styles (singing in Romanian, English, French and Gipsy Serb) combined with aggressive riffs, groovy bass lines, percussive drums and atmospheric keyboards. In the year 2014 Dirty Shirt earn the 2nd place on the prestigious Wacken Metal Battle, at Wacken Open Air festival, in Wacken Germany.